Welcome to Brown Auto Sales where we are proud of the quality used cars we sell and our dedication to serve the needs of our customers. This is reflected in the amount of repeat business we receive. Whether this is your first purchase with us or one of many that you’ve had, you can count on our FAMILY to make it the best buying experience possible. From the moment you step on our lot until the time you drive away in your next car, your buying experience with Brown Auto Sales is our number ONE Priority. 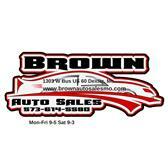 Brown Auto Sales & The Brown Family is here to help you find the right car at the right price! Be sure to visit our virtual showroom of inventory available for purchase. There you will see detailed information about each vehicle, a picture gallery, as well as convenient ways to contact us for more information about that vehicle. We are located at 1303 W Business HWY 60 and are available by phone at 573-614-5580 or After Hours Text 573-281-9957. You can also get driving directions and hours of service from our user friendly website.